Product #2581 | SKU AT4022 | 0.0 (no ratings yet) Thanks for your rating! 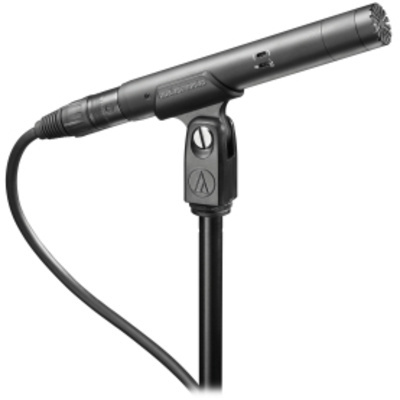 The AT4022 Omnidirectional Condenser Microphone from Audio-Technica features a low-profile design and a small-diaphragm condenser element. The microphone's sensitivity, frequency response, and SPL capabilities allow for use with speaker cabinets, vocals, percussion instruments, drums, and spot placement on guitars, and stringed instruments. The omnidirectional polar pattern provides a wide pickup area and preserves the integrity of the signal. An 80 Hz high-pass filter switch reduces low frequencies and associated noise, and a -10 dB Pad switch provides additional headroom and minimises distortion when capturing transient (peaking) audio signals. The package includes microphone stand clamp, a windscreen, and a protective carrying case. The omnidirectional polar pattern provides a generous pickup area and preserves the integrity of the audio quality. The 80 Hz high-pass filter switch minimises hum, low frequency noise, and rumble. A -10 dB Pad provides additional headroom for capturing peaking audio signals without distortion and noise.